What are LED Christmas Lights? In recent years, LED Christmas lights have proven to be a more durable, energy efficient and cost effective way of illuminating your home around the holidays. They use much less wattage, they run 50-times longer and are safer all around. But what exactly is this technology, and more importantly, why is it so much more efficient than the run-of-the-mill incandescent bulbs? Why LED for Holiday Lights? Let’s look at a little history of LED technology: The discovery of LED technology is thanks to a Russian radio technician named Oleg Vladimirovich Losev who discovered in the 1920s, that the diodes in radios emitted light. 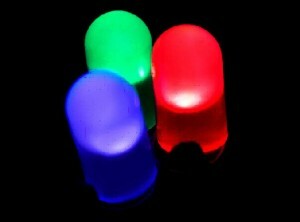 In fact, LED stands for light-emitting diode. LED technology is based on the movement of electrons through a electric diode and when the diode is turned on, energy is released in the form of light. While Losev is credited to the discovery, any practical use wasn’t discovered until the 1960s when a General Electric employee named Nick Holoyak Jr. developed the modern light-emitting diode. But it wasn’t until 1968 when Hewlett Packard found a real use for the technology in their calculators. Since their inception, it has been realized that LED technology was much more energy efficient than using incandescent lighting, but was more expensive because it required a more exact science. It was in 1998 when LEDs were being used for Christmas lighting. Today, America is beginning to switch over to LEDs in all aspects such as lawn lighting, outdoor home lighting and Christmas lighting. In 2007, the famous Rockefeller Center tree in New York City was illuminated with 100% LED lights. In today’s tough times, the fairly new technology is gaining large momentum in the holiday decorating industry is saving businesses and consumers lots of money by cutting back 75% of holiday energy consumption while stimulating the economy.